People have been posting on FB about where they were and what they were doing 30 years ago today when the space shuttle exploded. I can tell you exactly where I was - in the school library - must have been a study hall. But what I remember most about that tragedy was that the weekend after it happened my boyfriend was home from college and we went to see Out of Africa at the Nickelodeon. After the movie we were leaving out the side exit to the back parking lot when I realized he was crying. It took me a minute to figure out he wasn't crying because (spoiler alert) Robert Redford's plane crashed, he was crying about the astronauts. 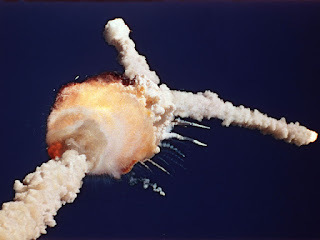 That's what I remember most about the Challenger explosion. I remember the day as an inservice day. The next Monday when school resumed, I was expecting the eighth grade students to be quite disturbed by the tragedy. They were. However, they also had a few jokes which weren't that nice but softened the blow of the incident.